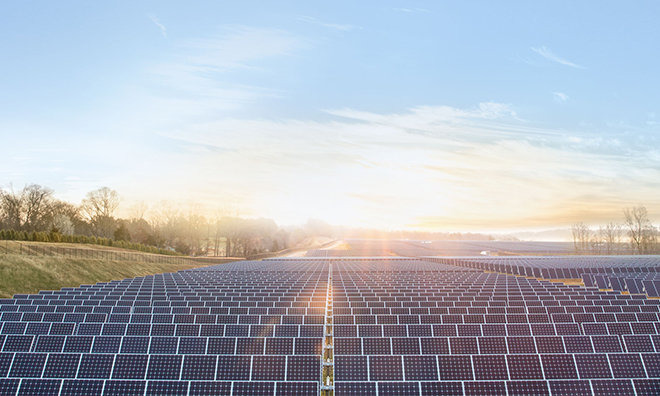 Apple, Akamai, Etsy, and Swiss Re have announced an agreement to develop two new wind and solar energy farms in Illinois and Virginia to provide power for company operations in in the eastern United States. Spearheaded by Apple, the new projects will generate 290 megawatts to the PJM electric grid serving much of the Eastern United States, including areas of Virginia, Illinois, Pennsylvania, New Jersey, and Maryland. By collaborating with Apple, Akamai, Etsy and Swiss Re were able to access wind and solar power from the new projects at competitive prices and agreement terms. That 290 megawatts will be used for company operations, but would be sufficient to power 74,000 houses if it were so utilized. "At Apple, we're proud to power all of our operations around the world with 100 percent renewable energy," said Lisa Jackson, Apple's Vice President of Environment, Policy and Social Initiatives. "In the process, we've charted a course for other companies and organizations to purchase renewable energy and transition their own operations to greener power." As an insurance provider, the Swiss Re Group anticipates and manages risk including that from natural catastrophes, climate change, aging populations, and cyber crime. Headquartered in Zurich, Switzerland, where it was founded in 1863, the Swiss Re Group operates through a network of around 80 offices globally. "Swiss Re aims to reduce its carbon footprint and support renewable energy, which is why we're so happy to be part of this collaboration," said Brian Beebe, Head of Origination North America, Weather and Energy, Swiss Re Corporate Solutions. "We also hope to speed up the adoption of these clean technologies through Swiss Re Corporate Solutions' innovative insurance products, which help owners of wind and solar assets decrease cash flow uncertainty." Akamai has been Apple's content delivery partner for some time. The company has 200,000 servers across 130 countries —including a large facility in Virginia that is potentially serviceable by the power deal. Power company sPower is the largest private owner of operating solar assets in the United States. The company owns and operates a portfolio of solar and wind assets greater than 1.3 gigawatts and has a development pipeline of more than 10 gigawatts. sPower is owned by a joint venture partnership between The AES Corporation (NYSE: AES), a worldwide energy company headquartered in Arlington, Virginia, and the Alberta Investment Management Corporation, one of Canada's largest and most diversified institutional investment fund managers. "We commend Apple's leadership in this collaboration between them, Akamai and Etsy," said Ryan Creamer, CEO of sPower. "Without this group of forward-thinking companies this project would not be a reality. The move may be self-serving for Apple beyond environmental stewardship. The company is said to be looking at three locations in or near the DC metropolitan area for its second headquarters.